Commissioned from the artist by the present owners' grandparents, and by descent. Painted in 1913, this work is unusual for Henry as it is one of only a handful of paintings that he dated. As a commissioned work, depicting the garden at Ballyeighan, it also stands in contrast to much of the artist's work of this early period which was concerned with the people of Achill Island, where Henry had moved in 1910. 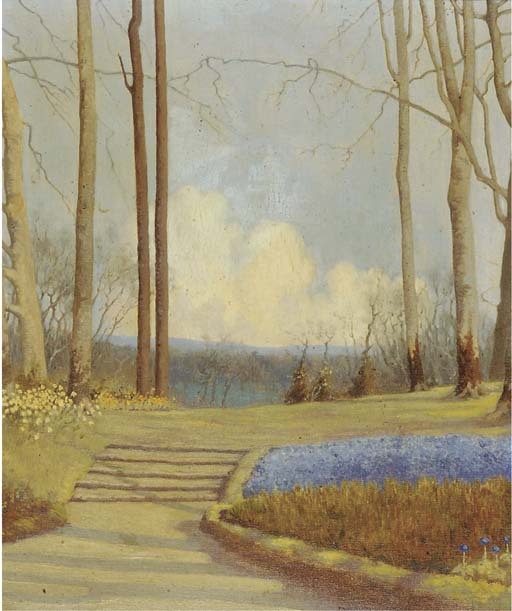 Painted in Henry's typically muted palette, a comparison can be made to much of his oeuvre, where landscapes are imbued with an indication of humanity in the low lying cottages. Although the present work is empty of figures it does, however, contain a strong human presence in the apparent landscaping of the garden and man-made steps.